Free drop-in program for families, inspired by gallery exhibits and seasonal Japanese events. 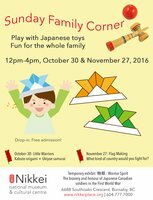 We provide Japanese traditional toys to play with as well as teach origami. Every month we introduce a special craft to create in relation to the gallery exhibits. November’s feature activity is creating your original Nobori – a Japanese banner flag. NNMCC . Last modified Oct 11 2016 12:08 p.m.